Ageless Hands: Do Your Hands Tell Your Age? One of my regular patients, 50-year-old Mrs Jane V, was very ashamed of how her hands look. “They’re old. They’re ugly. I don’t live that glamorous of a life, but when I do dress up and I do go out, I don’t want people staring at my hands,” was Jane’s usual complaint. Like many women her age, Jane is beginning to feel the pressure to look younger. “I never really worried about it till the last three or four years and all the sudden, you get old,” said Jane. 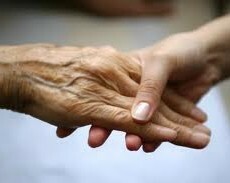 Just like the fine lines and wrinkles on your face, your hands say a lot about your age. As we get older, the skin on our hands becomes thinner and we lose some of the fat and muscle surrounding our bones, which can make our veins bulge. 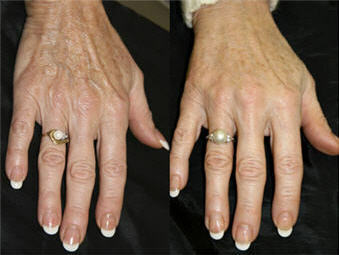 But, Jane and other women are getting the upper hand with an increasingly popular hand rejuvenartion procedure. It is quick, virtually painless and can take years off your hands without surgery or anesthesia. We use a combination of Dermal Fillers, Laser and Chemical Peels all in one session to take of atleast 5 years from your hands. Over time, veins, wrinkles and sun damage become less noticeable and smaller veins may disappear altogether. But don’t worry. Experts say there are plenty of other vessels deep under the skin to keep blood flowing to your hands. Like any other cosmetic procedure, there are risks such as infection or allergic reactions. Other possible side effects include swelling, redness and bruising near the injection sites. There is little to no down time and In just 20 minutes Jane is well on her way to looking years younger. “I’m hoping I won’t be so ashamed of my hands and I’ll start doing my nails again and wearing my rings,” said Jane. Patients should notice a marked improvement in two to three weeks, but some may require a second or third injection to get lasting results. Most people will need a touch-up every two or three years. As for the costs Hand Rejuvenation at The Wembley Medical Spa will range from R3500 to R8000. Before going through with any cosmetic procedure, it is important that you do your research. Find a reputable doctor who is board certified, schedule a consultation and decide together what works best for you. 1. Protect your hands from the sun. Aside from the obvious benefits, like preventing cancer, wearing sunscreen can also help prevent wrinkles and age spots. 2. Keep your hands out of continuous hot water. It can be very hard on your skin. 3. Exfoliate. Removing dry, dead skin will make your hands look instantly younger. 4. Moisturize. Not only will it keep your skin from looking ashen and dull, but there are creams and lotions out there that also claim to make your skin firmer.